Bought off the rack thinking we would have an August wedding. 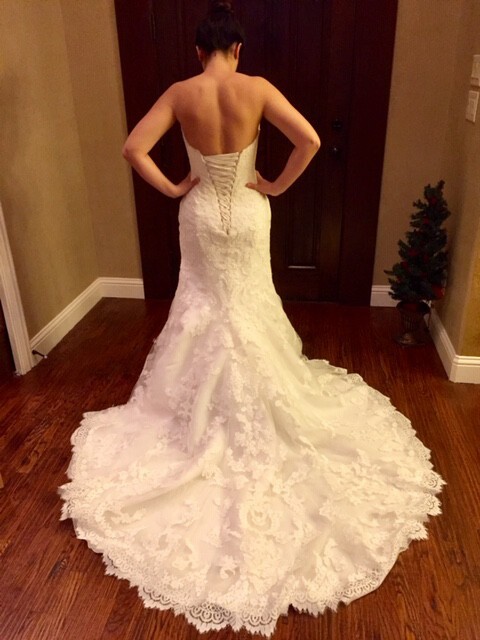 It was altered to a size 2 for my daughter who is 5'4". Never worn. Nothing wrong with the dress. We just bought another one for a winter wedding. Veil is included in the price. Custom-made to match the lace on the dress. Never worn. Value of veil was $183.00. Altered from a 10 to a 2, but with corset, it makes it adjustable. Hemmed for a 5'4" woman, but hemmed for wearing 3-inch heels. Once you send a message, Marsha can invite you to purchase the dress.